Um, after proofing the previous post, I realized that my description of the laundry lay-out was not that clear. We added on a master bedroom, bath, laundry and walk-in closet. And the closet is laid out like a long hallway and we use it like that. It opens to the laundry at one end, runs along the outside wall of the house with high, square windows which we can open for ventilation. The other side of the wall is the entry deck, covered with a long glass porch roof leading to the front door. So even if it's raining, we can still keep the windows open for fresh air. It makes the closet bright, airy and light. I hate closets that are closed, dark and musty. The opposite closet windowed wall, there are fold-out mirrored doors set between square columns. The whole closet is 18 feet long. We can go through the closet doors to the laundry area, turn the corner and walk into the bathroom. The bathroom has two doors that open into the bedroom. The toilet area is separate from the sinks, tub and shower area. So the traffic pattern in the addition is full circle. I like that. Opposite the closet doors on the other side of the bedroom, double French doors and 3 windows open out to a side-yard deck. The infamous shower stall. The tiles are in the kiln taking FOREVER to get to bone dry. Everything is flat, whole, and laid out on the shelves in one layer. I even remembered to make some small tiles on both edges of the fish band with my signature and date on them. 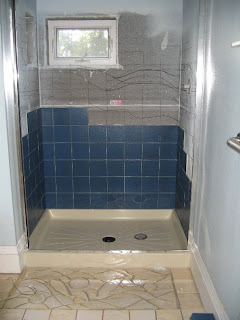 A tile contractor is coming today to start laying the floor in a smaller bathroom and hopefully, the shower tiles will be fired, glazed and ready when he gets to the master bath floor/tub surround/ shower phase.